Many neuroimaging studies of schizophrenia have shown abnormalities in the frontal cortex, limbic system, basal ganglia, temporal and parietal lobes. These findings are not specific or consistent enough to build up a coherent theory of the origin of the brain abnormality in schizophrenia. This paper describes a state-of-the-art approach of SPECT to correlate neuropsychological evaluation. PANSS scores and different brain focal abnormalities of two groups of patients receiving Clozapine and classical antipsychotic treatments were observed. A total of 20 drug-free patients, actively psychotic schizophrenic, were selected according to the DSM-IV criteria. Pre-Post-treatment was designed using PANSS and 99mTc- ECD-SPECT to assess regional Cerebral Blood Flow (rCBF). The results showed that after treatment, differences in PANSS scores were significant in both groups, with superior scores resulting from the Clozapine therapy. Results were supported by SPECT, which showed a greater improvement in the Clozapine group. Both positive and negative symptoms were improved with Clozapine as well. Before treatment, hypofrontality was the most common (85%) finding, whereas after treatment hypofrontality was mostly cleared. However, in some areas like temporal and caudate, hyperfrontality was induced. Negative symptoms showed linkage to hypofrontality in both groups before and after treatment, and both positive and negative symptoms were improved more with Clozapine therapy than with classical treatment. Schizophrenia is a chronic and disabling brain disease affecting around 24 million people worldwide and more than 2 million Americans in a given year. Approximately 1 percent of the population develops schizophrenia during their lifetime [8-11]. Risk factors include birth in cities, birth in winter and early spring, and viral infections in the mother during the second and third trimesters of gestation. A strong association between hypofrontality and negative symptoms of schizophrenia, as well as with antipsychotic treatment, has been reported. Some studies have reported that about half of the chronic cases of schizophrenia show hypofrontality at rest [11-13]. Studies have shown that individuals with schizophrenia, including those who have never been treated, have a reduced volume of gray matter in their brains, especially in the frontal and temporal lobes. [5,7] Patients with the worst brain tissue loss also have the worst symptoms, including hallucinations, delusions, psychosis and bizarre behaviour [14-17]. Therefore, through early diagnosis and appropriate treatments we can make the illness less severe and more tolerable for the patients and their families. Dopamine hypothesis, which posited that schizophrenia was caused by abnormalities in dopamine production and activity in the brain, was first proposed in the 1950s. The basis for the hypothesis was that the most widely used drugs for the treatment of schizophrenia block dopamine D2 receptors and signal transmissions by dopamine. These drugs function as antipsychotic medications and reduce delusion and hallucination. By contrast, drugs such as amphetamine reinforce signal transmissions by dopamine and induce schizophrenic symptoms such as delusion and hallucination. A large body of theory and evidence now holds that a failure to properly develop glutamate neurons is responsible for much of the pathology in schizophrenia. According to this hypothesis, schizophrenia is associated with increased activity in dopaminergic neurones . Clozapine (Leponex) is the prototype of atypical antipsychotic drugs that are used to treat patients with schizophrenia who are unresponsive or intolerant to typical antipsychotics. It is effective in treating the positive and negative symptoms of schizophrenia. As demonstrated in this paper, Clozapine is more effective in schizophrenia than older antipsychotics. It may also help to reduce relapses, suicide and the need for hospitalization. Clozapine is characterized as atypical by its preferential binding to serotonin 5-HT2 and dopamine D4 receptors relative to dopamine D2 receptors. Dopamine receptors involved in Clozapine therapy included D4, D2, serotonin type 2, norepinephrine, acetylcholine, and histamine [20-22]. Functional brain imaging methods have been applied for studying schizophrenia. These methods include positron emission tomography (PET) , SPECT for studying CBF and neuroreceptors, and more recently, functional magnetic resonance imaging (fMRI) for measuring changes attributable to cerebral blood flow. In this paper, after summarizing the application of brain SPECT in schizophrenia research, the author presents the study that has been conducted and integrates it with our current understanding of brain function in schizophrenia. Scans have become more sensitive through the use of the rotating camera. Improvements in camera designs, collimator design and in reconstruction algorithms have substantially improved the quality of SPECT images using the Anger type gamma camera. SPECT images can be merged with MRI and CT, creating a single image that combines anatomy and physiology. Three dimensional surface and volume- rendered images add perspective and facilitate the localization and sizing of lesions. Systems should be capable of sequential image acquisition. The option to acquire multiple short studies back to back makes it possible to subsequently discard segments degraded by patient motion [3, 23, 26,28]. Supporting software includes dynamic filters, multiple angle reconstructions, surface variable attenuation corrections, three dimensional/conventional /cross sectional displays. The computer then reconstructs 3-D images of the brain (Figure 1). With these brain maps, physicians are able to identify certain patterns of brain activity in different psychiatric and neurological problems. Basically, in a typical brain SPECT we are looking for an asymmetry and different activity levels and comparing it to what we know as a normal brain (Figure 2). A normal SPECT image reveals homogeneous and uniform tracer accumulation throughout the cerebral cortex, with the cerebellum being the area with the most intense activity [24, 26, 28]. The study was conducted under a protocol approved by the committee at Tehran Psychiatric Institute, Iran Medical University and Rajai Hospital Research Center, Tehran, Iran. Twenty random samples in an acute phase of schizophrenia (drug free and drug naive) were selected after a proposal study had been completed, according to DSM-IV from the different outpatient and inpatient clinics and teaching hospitals. Eleven men (ranging from 24-40 years) and 9 women (ranging from 18-40 years) were placed in 2 groups, the Clozapine and classical groups, according to the selected treatment. The mean duration of illness was 8.7 years, ranging from 1-19 years (Table 1). Two subjects were not cooperative for the second SPECT, so data from these two patients were not included. 88% of the classical and 90% of the Clozapine group suffered from delusion, while 88% of the classical and 54% of the Clozapine group showed hallucination. The control subjects were 12 healthy volunteers [8 men aged 34 ± 6.5 (S.D.) years, 4 women aged 33 ± 3.5 (S.D.) years]. Drug-washout was 3 months prior to the PANSS and SPECT scanning. Exclusive criteria: age less than 18 years, more than 65 years, neurological and general medical condition and pregnancy. The mean daily dosage for Clozapine: 300mg, and for classic: equal to 600 mg chlorpromazine. The SPECT study was performed using a single-head rotating gamma camera (Sophycamera- SMV-DSX). 64-40 seconds frames were collected during a 360 degree rotation in a 64x64 matrix with a zoom of two obtaining a 4.5 mm pixel size. Data acquisition was started 40 minutes after IV injection of 740 MBQ (20 mci) of 99mTc-ECD (Neurolite, Kavoshyar co.). As a clinical tool for rCBF evaluation by SPECT, ECD (ethyl cysteinate dimmer) has recently being introduced. Results of rCBF in schizophrenia are considerably limited to the use of the older radiopharmaceuticals like 99mTc-HMPAO (Hexamethyl propylene amine oxide) and I131-IMP (Iodoamphetamine). Fewer data are available from rCBF studies in schizophrenia by 99mTc-ECD . In general, ECD has several favourable characteristics: A. Chemical stability lasting several hours after reconstitution, B: Fast blood clearance, C: High signal-to-noise ratio. A brain CAT scan or MRI was performed on each subject before the SPECT, to rule out any pre-existing medical conditions and for parallel comparison with SPECT. As stated in Table 3, ROIs (region of interest) were positioned in 8 canthomeatal slices in each side. For every ECD brain SPECT the subjects were seated in a quiet room with closed eyes, 15 minutes before the injection. Before the SPECT scanning, all subjects had an intravenous line established while they were lying down. Each subject received an intravenous injection of 99mTc-ECD, which crosses the blood–brain barrier on first pass, is rapidly taken up by neural cells, and is distributed in proportion to regional cerebral perfusion. Because 99mTc-ECD remains fixed in the cells after uptake, its distribution provides a picture of the pattern of brain perfusion immediately after administration. Therefore, the effect of sedation on measured rCBF should be negligible. Thirty minutes after the administration of 99mTc-ECD, each subject was given sedation in the amount of 10 mg Diazepam to decrease motion during scanning. Ten minutes after injection of Diazepam, SPECT scans were taken. Therefore, data acquisition started 40 minutes after ECD IV injection for each subject. Table 1 shows demographic and clinical characteristics of the study. SPECT scans were interpreted independently by three nuclear physicians who were unaware of the patients' diagnoses. Intra-observer agreement ranged from 60 to 90%. PANSS scores also were evaluated by three researchers independently, and the agreement ranged from 75 to 95%. Before treatment there was no significant difference on the PANSS between the Clozapine and classical groups. We conducted Levene's test for equality of variances in PANSS; F = 0.197, P = 0.662 and t-test for independent samples (before any treatment); t (pre)= 2.50, t (post)= 2.48, was done to rule out possibility of bias in choosing the samples. In addition, statistical analysis ruled out the possibility of any baseline difference effects between the Clozapine and classical treatments. The PANSS scores, pre and post treatment (Table 2), were compared using t-tests for dependent samples (for ten subgroups). The Pearson's correlation coefficient was used between different SPECT areas and PANSS subgroups. All statistical tests were two-tailed with a 0.05 alpha level. Before treatment, the total classical PANSS score was 175 and after treatment it decreased to 111 (P<0.001, N=9); t = -5.98. Before treatment, the total PANSS score in the Clozapine group was 235, and after treatment it decreased to 123 (P<0.0001, N=11); t = -7.83. Results were supported by SPECT, which showed a greater improvement in the Clozapine group. Table 3 shows the comparison of the mean values of relative perfusion in schizophrenic subjects pre and post treatment. The results show that the mean rCBF values of the schizophrenic patients were significantly lower than those of the control in all frontal, temporal, thalamus/basal ganglia, caudate and parietal regions. So, we selected the region of interest for correlation. Table 4 shows the severity index of pre-post treatment in both groups. The results show the superiority of clozapine to classical treatment in schizophrenia, particularly in Superior frontal, anterior and posterior parietal and caudate, which show the most changes in the Clozapine group. In Table 5, the findings show only significant correlations (r > .50, r ≤ -.50), p< 0.05. The most common abnormality in the schizophrenic brain SPECT was shown to be a decreased rCBF in the superior frontal region, which was cleared mostly by the Clozapine therapy. M: male, F: female, E: employed, U: unemployed, Y: year, T: times, Mon: month. The Cerebellum had no significant changes before and after treatments. The occipital region only showed some non-significant changes. Severity index was calculated as; degree of severity x number of hypo/hyper-intense areas in different brain regions. Negative numbers mean decrease of rCBF and positive numbers mean increase in rCBF. * Means of severity show the most changes in these regions, particularly in the Clozapine group. Inferior frontal and cerebellum have no significant correlation with PANSS scores. *Only bold numbers (first row) in superior frontal had r < -0.60, p< 0.01. At this step all PANSS subgroups were related to the brain regions, and this showed the correlation between positive symptoms with the left thalamus/basal ganglia, left anterior parietal and left superior frontal after treatment in both groups. For negative symptoms correlations were seen in the left temporal, right post parietal, right thalamus/ basal ganglia before treatment and with the left superior frontal after treatment in both groups, but as the findings show, the correlation was only significant with two of them (Table 5). The composite (positive-negative) subgroup correlation was significant with the right caudate before and with the right superior frontal after both treatments. General psychopathology correlation was only significant with one region in post treatment: the left superior frontal. And for Anergia it was significant in bilateral post parietal regions in both groups. Paranoia correlated significantly with two brain regions: the left temporal before and the left superior frontal after both treatments. For depression the correlation was significant only with one region: the right superior frontal in post-treatment in both groups. Incidentally there was a strong correlation (p < 0.01) between the right temporal and right anterior parietal, and also between the right caudate and right thalamus/basal ganglia. In addition, based on our study, positive symptoms have a strong correlation with paranoia, thought disturbance and less with negative symptoms; whereas, negative symptoms have a strong correlation with activation (P< .007) and less with paranoia (P< .011). First, PANSS score differences (pre-post treatment) were significant in both the classical and Clozapine groups and for all subgroups, except for the composite subgroup, which was positive-negative. Therefore, both treatments have their benefits for schizophrenia. Some studies have reported that the efficacy of Clozapine is clinically significant on the negative symptomatology but is delayed compared to the efficacy on the other dimensions of symptomatology evaluated using the PANSS [3,20,22,25,26]. Based on these studies, both positive and negative symptoms seem to be improved with Clozapine. In addition, some studies have shown that negative symptoms improve in direct relation to positive symptoms in schizophrenia after Clozapine therapy [25,26]. Based on our study, positive symptoms have the strongest correlation with paranoia and thought disturbance and then with negative symptoms, whereas negative symptoms have a strong correlation with activation and less with paranoia. In other words, positive symptom improvement means less paranoia and more cooperativeness. And negative symptom improvement shows more activity and cooperativeness, and less paranoia as well. In our study, difference means of PANSS subgroups were more significant in the Clozapine group than the Classical group, which showed in decreasing order: general psychopathology, anergia, positive and negative symptoms, in compare with the classic group, which was in decreasing order; general psychopathology, positive and negative symptoms. This finding shows the priority of positive symptom improvement to negative symptom by both treatments. Second, corresponding with the widespread literature that frontal hypo-perfusion is the most consistent finding in the resting state of chronic schizophrenia [10-13,27], the most common finding in our study was a decrease of perfusion, mostly (85%) in the superior frontal region (17 out of 20 cases). Although some researchers have pointed out that frontal hypo-perfusion might be associated by chronicity of illness or long-term anti-psychotic treatment or even the aging process, most studies have shown a reduced frontal cerebral blood flow in drug-naïve patients. Thus, decrease of frontal perfusion can be an existing finding before any clinical manifestation of schizophrenia. Third, in our study, we found a significant negative correlation between negative symptoms and hypofrontality in both groups, especially in the left superior frontal (Table 5). This relationship between negative symptoms and frontal hypo-perfusion has been supported by many other studies [12,13]. However, there is another argument that in the first-episode of schizophrenia, and in the acute phase, hyper perfusion in the frontal and temporal region is dominant, unlike the chronic phase which exhibits hypo-perfusion. At any rate, such hypo-perfusion correlates positively with some acute schizophrenic symptoms and with their severity [6,12]. Fourth, in the temporal region there was an increased perfusion and mostly in the left side with the Clozapine therapy, but not with the classical treatment. This pattern is usually seen in hallucinatory states [1,11,14,15], but here under antipsychotic treatments and the resulting PANSS scores improvement, this finding may demonstrate an over-reaction to Clozapine therapy, not a hallucinatory state. Future studies will help us understand more about this reaction. Fifth, contrary to our expectation, based on passed studies, a significant increased rCBF was observed in the thalamus, particularly with Clozapine treatment. This can be due to Clozapine's effect on the thalamus by dopaminergic receptors, which is less with the classical treatment. It may explain some higher efficacy of Clozapine to the classical treatment, especially on refractory schizophrenia. In conclusion, based on our study and past studies, schizophrenia can affect different brain regions, from the frontal, temporal, parietal to the thalamus and basal ganglia. Some studies show hypo-perfusion, others hyper-perfusion. This variety and inconsistency in results may explain the real nature of this illness. Our study has shown the superiority of Clozapine to old antipsychotics in treating schizophrenia. I wish to thank Kamali M, Dr. Seyfollahi-asl Sh, Dr. Hirsch J, Dr. Geliebter A, Lorence M, Dr. Sharafi R, Afkhami A, Dr. Mostafavi-abdolmaleky H, Dr. Nasr-esfehani M, Dr. Rastgoo F, Sharafi E, Dr. Yaghoobi N, Dr. Hekmat and Mr. Kahani for their useful comments and suggestions. This article would not have been possible without the assistance of my dear friend, Dr. Seyfollahi who was instrumental in taking the SPECT pictures. This study was done in cooperation with Navvab Psychiatric Hospital and Rajai Hospital, Nuclear Medicine Department, Tehran, Iran. Mohammad Sharafi obtained MD from Kerman Medical University, and a specialty in psychiatry from Iran University of Medical Sciences, where he worked in the research areas of schizophrenia, mood disorders and OCD by SPECT. He is currently working on research of brain fMRI and binge eating at fMRI Research Center, Columbia University. His main clinical interests include schizophrenia, mood disorders and brain mapping. 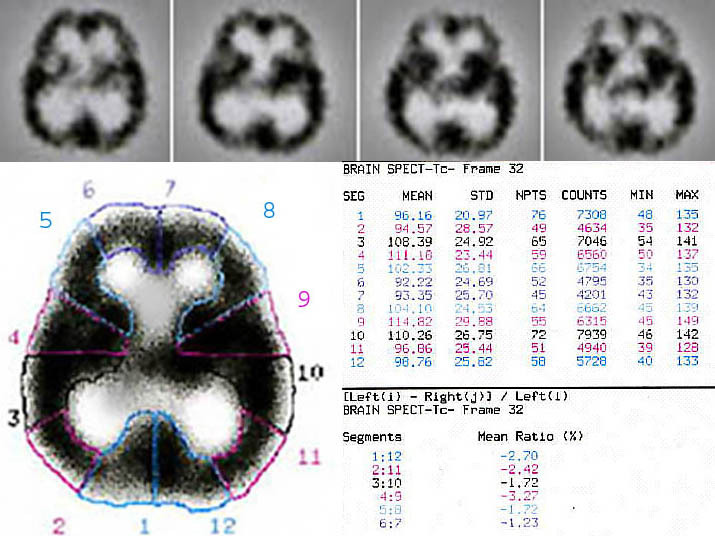 Quantification of regional involvement in schizophrenia; a sample of 99mTc-ECD-Brain SPECT data analysis in a schizophrenic patient. Data was processed by a DSX computer vision (revision-7.0) and picture reconstruction was performed by using Butterworth filter with automatic attenuation correction. Single-photon-emission-computed-tomography, as its name might suggest, relies heavily on computers to acquire, process and display the SPECT image. As image processing software and hardware become smaller, faster and just "better", SPECT will adapt and incorporate those advances it can use. It is hoped that improvements in parallel processing and computer architectures will make Bayesian reconstruction faster and take less computer memory, and thus make it more attractive for potential use in the clinic. SPECT by 99mTc-ECD in a 39 year-old drug naïve schizophrenia, pre (up) and post (down) treatment with Clozapine. A severe hypo-perfusion in right occiputo-posteroparietal (upper transverse cuts # 9-15) has been nearly removed after 3 months of consistent treatment.